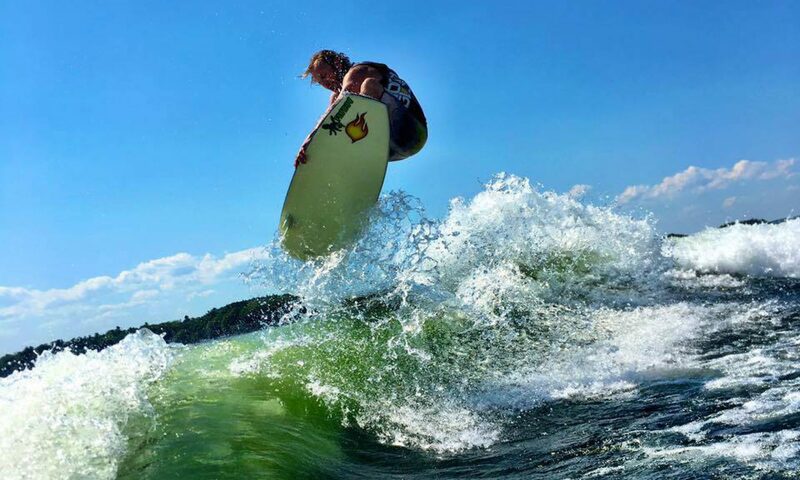 Lake Champlain is a great lake to learn to wakesurf whether you’re just visiting for the summer or you’re lucky enough to call Vermont home. Malletts Bay is one of the most popular areas on the lake due to warmer water temperatures and protected bays. Hot air balloons can be seen over the bay and amazing VT sunsets paint the Colchester sky. As the 13th largest lake in the U.S. (490 mi²), Lake Champlain is unofficially referred to as the sixth Great Lake. It flows north from Lake George in New York and creates border between Vermont and New York. It measures 107 miles (172 km) in length and 14 miles (23 km) across at its widest point, and has a maximum depth of approximately 400 feet (120 m). The lake varies seasonally from about 95 to 100 ft (29 to 30 m) above sea level. Malletts Bay averages 60 feet depth. Lake Champlain drains nearly half of Vermont, and approximately 250,000 people get their drinking water from the lake. It is connected to the Hudson River by the Champlain Canal. It’s possible to boat from here to New York City, the Great Lakes, Montreal and even out the St. Lawrence River reaching the Atlantic Ocean! We receive many visitors from Lake Bomoseen and Lake George regions because of their proximity. Lake Champlain is rich with American history, with several historic battles taking place during the Revolutionary War. The lake is known for having well-preserved ship wrecks for divers to visit. Parts of the lake freeze each winter, and in some winters the entire lake surface freezes, referred to as “closing”. In July and August, the lake temperature reaches an average of 70 °F (21 °C). While you’re in the area, be sure to check out these additional VT places of interest, that will likely appeal to your “extreme” side!